Hand made in Bologna, Italy, Fiorentini + Baker brings us another fabulous Autumn/Winter line of boots featuring supple leather, meticulous attention to detail and classic urban styling. Their famous buckle boots have been highly sought year after year and have grown a devoted following of their own. You’ve probably seen one of your favorite celebs – from Kate Beckinsale to Gwyneth Paltrow and Jessica Alba to Sarah Jessica Parker – loving Fiorentini + Baker… Hurry up and discover the Fiorentini + Baker touch from the hand nailed soles to the hand treated leather! It’s in! The much anticipated “Bailey Button” has arrived and is a fabulous new addition to a collection living up to the Ugg Australia tradition of comfort, comfort and more comfort! Featuring soft suede and plush shearling along with a button and elastic closure, you can wear this boot half open or looped and closed. Take your pick of chestnut, black, grey or sand at Footnotesonline. As a brand steeped in history and rooted in the classic American West, Frye footwear is one of just a handful of brands that has not only merely survived the test of time, but has thrived. Luxuriously comfortable, time-trusted durability, and classically styled, for over a century Frye has been a household name and can be counted on to remain at the forefront of fashion and comfort for many more years to come. In addition to the classic Frye ‘Harness’ and the trendy Frye ‘Veronic Slouch,’ just in at Footnotesonline is the new Frye “Deborah Studded.’ This heel-kicking ankle bootie packs a stylish punch with a distressed leather look and shimmering studded detaling..
As the first fashion house to launch Prêt-à-Porter fashions in 1956, Chloé’s statement on trend and style has been authoritative, globally respected and, of course, fabulous! The Fall/Winter 2009 collection of boots is absolutely stunning as a meticulous attention to curves, supple leathers and true wearability keep Chloé at the forefront of feminine, trend-defining fashion. If you are going to splurge on any one boot this season, any Chloe will prove to be worth every penny… for years to come! With a century long established history of high quality, premium rain boots in the damp UK, the Hunter boot company has been the premiere maker of durable rain boots for gardeners, soldiers, equestrians, and most recently, the fashion forward. With April showers here in the Northeast US, now’s the time to guard against rain this spring, next fall, and beyond. New Stuart Weitzman Sale Items! Visit the Best of Stuart Weitzman on Sale at Footnotesonline. In Season and On Sale! The latest and hottest luxuriously weatherproof Aquatalia by Marvin K. boots and shoes are on sale! Save up to 50% off the latest and greatest from this designer adored by women for his meticulous attention to detail, chic styling and unsurpassed comfort! Shop Aquatalia by Marvin K.
If you’re not hunting them down for yourself, you’re probably hunting down the Classic Talls for somebody on your gift list. Now is the time to avoid a disastrous and stressful holiday season by grabbing this seasonal must-have. Because of the double-shearling lining and unbelievable comfort, Ugg Australia boots are guaranteed to remain a must-have this season and beyond! Plus, they look as natural on campus as they do on the street or at work! Shop Ugg Australia at Footnotesonline where they have dozens of styles in every size available in-stock to ship immediately! 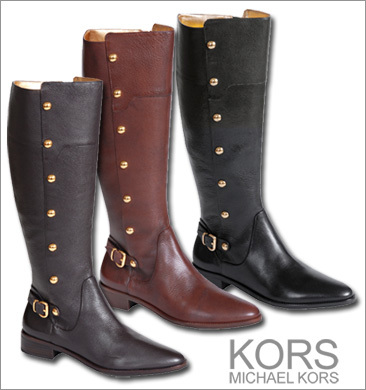 Indulge in chic riding boot style with the Eagle from the Kors by Michael Kors Fall 2008 Collection. This sleek boot with Kors’ signature clean lines and polished look will beautifully polish any look you put together this Holiday season. It’s also a classic look guaranteed to look as stylish next winter as it does this. It is available in Black, Brown or Cognac leather. It features brass studs and a polished buckle along with a side zipper making it easy to slip into this comfortable boot. 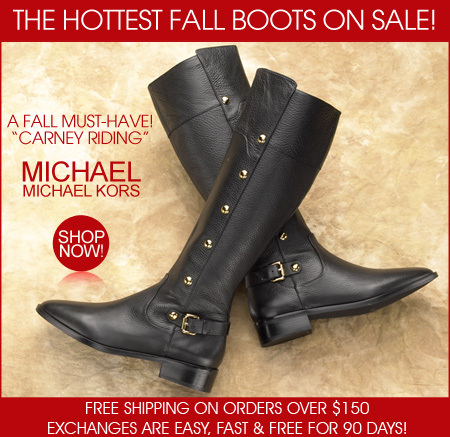 If you loved the Kors Eagle, Check out the New for 2009 Michael by Michael Kors Carney Boot which features the same riding boot look!! HOT! Adored around the world for ultra comfortable women’s shoes, in a few short year’s UGG® Australia has evolved into one of the most sought after brands. With a collection of boots, shoes and sandals that can take any woman from June to January and everywhere in between, one of the brand’s big staples is the Dakota moc. Any woman who slips into these immediately falls in love with the ultra-plush, smooth shearling lining has found a versatile shoe that perfect for daily wear. Available in Chestnut and Chocolate, this suede moc will make the perfect gift to yourself or mother, daughter or friend.